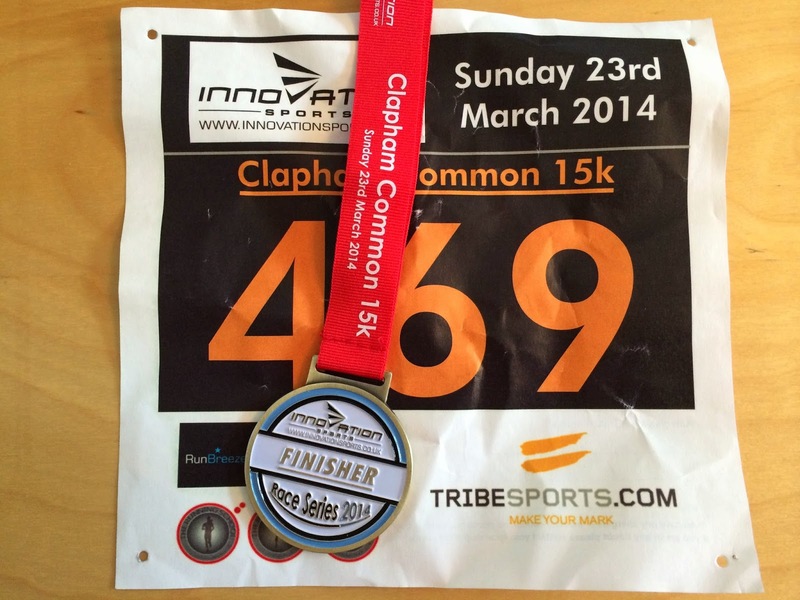 It's Clapham Common 15km race time again, courtesy of the friendly people from Innovation Sports. Yes, marathon training is back on track following the interruption of spring triathlon camp, and today called for a 32km long run. I've recently reset my target marathon pace and although today called for just an average long run, normally slower at target pace, I wanted to try a segment at pace when already fatigued. I've had a hard week of training, so that combined with a long warmup run should get me tired enough to see if I can still maintain pace when tired. Conveniently, its the first of these events of this year's season, so I decided to incorporate it into my long run. I took a slow jog up to the common, getting 12km done before race start. Pace was slow, a minute per kilometre under marathon pace, but that's fine. I registered, picked up my number, and took shelter from the cold wind in the café to pin on my race number. It seemed like the number of competitors was down on previous events, but on a chilly March morning I guess that's no surprise. The little kids have a short event at around 9:30, then the 5km participants go off at 10:00, the 10km at 10:02, and then me and the rest of the 15km entrants at 10:04. My aim was to hit on or around 5:30/km for the full distance. I went off very slightly fast at 5:22 for the first kilometre, and then settled in well. I was tired from a hard week with a couple of hard gym sessions at The Athletic Edge and the 12km run, but I didn't find it too hard to maintain pace. I let faster people go off, I reeled in slower ones from the earlier races (and from mine who had gone off too hard), but my priority was holding pace. 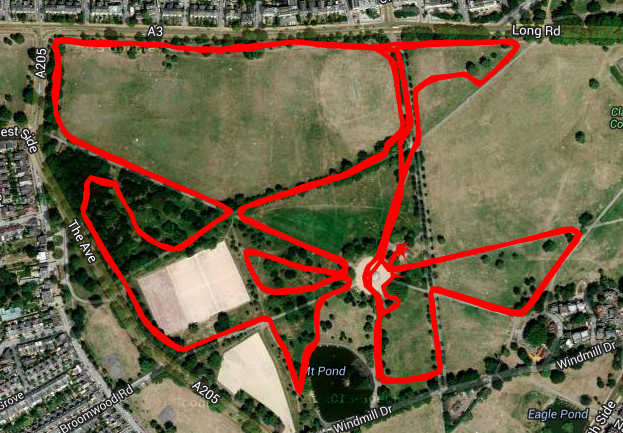 I'm pleased with this, it's a very twisty course, and was quite windy, as well as congested at times so that's worth a few seconds per kilometre. There was one kilometre section on each of the three laps which I ran slower as that had a drinks stop (I wasn't carrying any drinks so needed to take advantage of the aid station) followed by a very twisty slippery section through a forested area. I finished in 1:22.44, a couple of minutes slower than last time I ran the event, but I had a different objective this time, and a lot more running to do! I had another 5km to reach my 32km target, so switched back into nice slow pace for a trot back towards home. I'm starting to believe that my marathon target is achievable now, As long as I keep the next few weeks under control, stay uninjured, and taper well then I should be on track for somewhere around 3 hours and 50 minutes in Rotterdam in just 21 days' time. And now, I shall snooze whilst pretending to watch James Bond on the TV. Although I went with Mrs to Joe Beer’s Triathlon camp at Club la Santa in Lanzarote last year I was very much an observer - my ITBS was in the early stages of recovery and I couldn’t really do anything. I read a lot on our balcony and drank a little too much wine. I didn’t really enjoy the week - I wanted to be out on my bike (I did take it and went on a couple of solo rides but nothing large). I wanted to be able to run, and I wanted the camaraderie that comes from these shared experiences - friendships forged two-thirds of the way up punishing climbs, battered on all sides by the fierce Lanzarote winds. As it was, I read a lot of Alastair Reynolds (and went on to read his entire back catalogue in 6 months - there are some benefits to being injured and not training!). 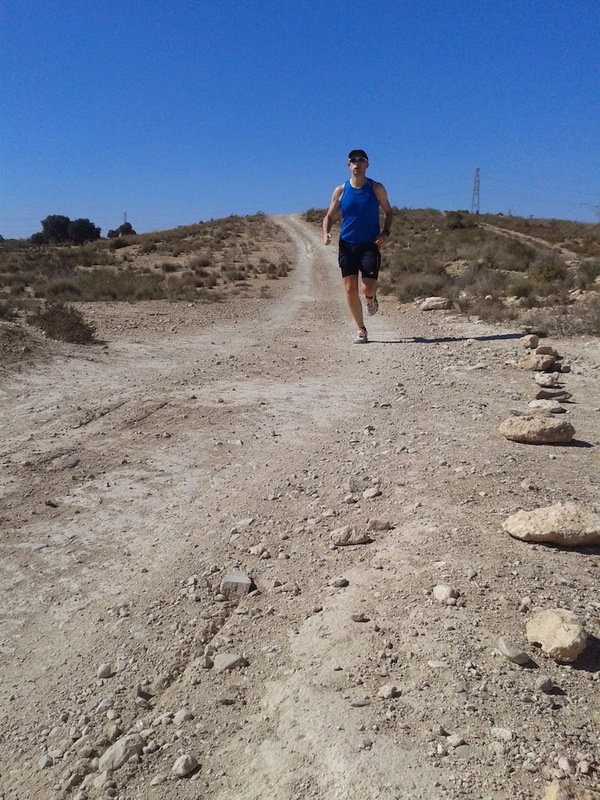 Mrs had a mixed time there, but didn’t feel that it had really ticked the training camp box for her, so she followed it up a few weeks later by going away again (without me this time) to The TriLife’s camp in Andalucia, sunny Southern Spain. Great weather was promised, but without the ferocious winds. Mrs returned totally re-invigorated - motivated, excited about continuing training, and full of praise for the TriLife team. We decided then that, circumstances permitting, we’d both go next year. With an EasyJet flight out at an ungodly hour, we decided to stay at Gatwick airport the night before. Taking the usual tram/train route, the journey was stress-free. It’s a strange experience travelling to an airport with no concern about arrival time - we even let a train go at East Croydon in order to grab a coffee from Costa. Frequent pit-stops are required when dragging around two giant bike boxes (as usual, on hire from the guys at www.bicycleboxhire.co.uk) and assorted baggage. The Sofitel at Gatwick North was nicer than I expected - featuring a vast atrium with reception, a bar, and a restaurant downstairs. We ate in the posh restaurant (we’re on holiday, right?) and I was pleasantly surprised. A jovial waitress, good swift service, nice wine (may have had some holiday bubbles...), and a good meal. I wouldn’t recommend a trip out to the airport just to eat here, but if you do happen to be staying over, give it a shot. Check-in was rapid and uneventful. We saw a few people with bike boxes, but didn’t know who would be with us on the trip. Queueing at the gate we saw Duncan and Liz who run The TriLife, Duncan introduced himself to me as usual, despite us having met on several occasions previously (he did the same at the Virgin London Triathlon last year - I guess I’m just a forgettable kind of guy!). On the flight I chewed through a few chapters of my latest read, House Of Leaves by Mark Z. Danielewski (a Christmas present from my parents-in-law and one utterly bonkers story - I’ve never read anything like it!). We were met at the airport by someone who had a van that was only just large enough to fit us and our luggage all in, and we were off on a 90 minute drive to Desert Springs Golf Resort, our base for the next week. The driver made reference to “The March Winds” which didn’t fill me with joy, but there was no going back now. Arriving at Desert Springs (which was always in my head as Radiator Springs, from the Disney/Pixar Cars movie), we were met by the other two coaches, Mike and Thom, and assigned our houses. Mrs and I were sharing with Claire Hebblethwaite, who it turns out has raced for Great Britain in the long distance championships! Crap, they aren’t all going to be GB athletes on this trip are they?! Everyone say, "I love swimming!" There was one session on this first day, a swim session to wash out the fatigue of travelling and get the training started. We drove down in a couple of minibuses driven by Mike and Thom, also our chauffeurs for the week, and within 15 minutes we were at the pool. We had three lanes reserved for the dozen or so of us. I was nervous. Often people downplay their fitness and training at times like this, but I honestly hadn’t swum since October! (Apart from a few lengths at Christmas in our hotel pool). Not been swimming since October! I swam as best I could. I thought I was slow, my goggles were wonky, I got tired quickly (though it passed as I slowly remembered the lessons I’d had from Jez two years ago). To be honest it was a bit of a blur. New people, new instructions (swim-coaching has its own language it seems), and new experience (I’ve never swum in a lane with other people in a structured session like this). I got through it without drowning, and lived to fight another day. I looked at the timetable for the rest of the week. Four more swims, and all an hour long - this one was only 45 minutes! On the bus to the pool we were assigned our swim lanes. I was in lane three, the “faster” lane. I very nearly queried it, I very nearly asked to be in a different lane, I very nearly let out an embarrassing “Whaaaa?…” noise. But no, I was in lane three. Better get on with it. So, with shoulders and triceps aching from yesterdays “introductory” session (which alone had doubled this year’s swim volume), here I was in a lane with an Aussie guy named Tom who had been competing in triathlon since he was 15, his wife Sue, a South African chap named Justin who looked like an anatomical diagram (does he have any body fat? ), and Claire the GB long-distance athlete. Oh crap. We had Thom as our coach on the end, “Right, 800 swim warm-up”. Hang on what? 32 lengths, to WARM UP? Oh well, better get on with it. The burning in my shoulders and triceps subsided during the warm-up, though I got lapped a couple of times. I tried hard. This was a whole new experience. I think we swam 8x 100m, 16x 50m, and 16x 25m. The timing meant that frequently I’d reach the end of a repetition only for my rest time to have already run out, and I had to turn straight away and push on with the next. When Thom announced we were doing "100s off 1:35" (meaning you have 1 minute and 35 seconds to swim 100m and then any time left over (yeah, right) is rest) I openly laughed at him - I've never swam that fast! This was killing me! Thom was keeping a close eye on us though, and thankfully gave Sue and me a little more rest - we sat out the middle 100m rep and then every fourth 50m rep. We both pushed on through and finished all the 25m reps though, I’m pleased with that. Wobbly and a bit light-headed, I put another couple of lengths in to cool down, and finished up. It was only 8:30am, and after breakfast there was a bike ride. There was plenty of breakfast, enough bacon, sausage, scrambled egg, and tomatoes to satisfy my high-fat low-carb requirements. We assembled on our bikes near reception, I was nervous. Often people downplay their fitness and training at times like this, but I honestly hadn’t cycled regularly for months (check my Garmin Connect history if you don’t believe me!). Hardly cycled for months either! My bike, despite living in a tent in the garden for the last 4 months, did not let me down. It performed admirably, good gear-shifting, good braking, and no annoying clicks or rubs. Nothing fell off. We took a circular route round the area, when the wind was with us we flew along, when it was against us we tucked down and pushed forward. Riding closely in a group was another new experience - the bike training I’ve done has been on my own so I’m not used to having to trust the person in front, or have the person behind put their trust in me. The aim is to be very close to the back wheel in front - so close you can’t really see the road so rely on signals and calls to raise awareness of bumps, holes, gravel, etc. The ride went well, even this first ride of the camp was my longest ride for months, I didn’t get any aches, and felt good. We had a short run scheduled for later in the afternoon when we got back. This was a short route at easy pace. As we've found before, mine and Mrs version of easy pace is quite slow compared to most and so everyone gradually pulled away from us. We were good to run along chatting though. 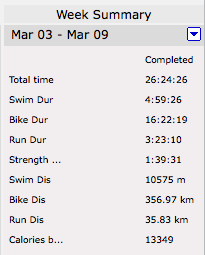 The day was good - first day for a long time I've ticked off a session in all of swim, bike, and run. I slept like a log. 9 hours, and I don't think I even turned over once! My arms were on fire during this morning’s swim. The lack of swim-fitness was apparent and I fatigued quickly. It turns out lane three wasn't really about speed (though the fastest swimmers were certainly with me) but more about the volume of swimming in the sessions that the coaches thought we could accommodate. Lane 3 had sets that were longer than lane 2, and theirs were longer than lane 1. The volume was certainly challenging. I swam until I had no idea what day it was, what length I was on, or what drill I was supposed to be doing! (OK, slight exaggeration, but only slight!). Next year I will be more swim fit in advance. I also need to bring all the "toys" (pull-buoy, paddles, fins, centre-snorkel - I missed out on some of the technique as a result of not having this kit). We had another ride today, it was still a bit windy. The group stayed mainly together. We were working well today, starting to get more comfortable with each other and building the trust you need to sit on someone else's wheel with just a few inches between you. It's an essential skill, the energy saving is substantial (well into the tens of percents). No run today, but a stretching session in the gym rounded off the day. A little down time, and then dinner, and then back to bed for another 9 hour sleep. I don't think I would have got through the week on any less sleep - it's such an important part of a big training week. Thursday featured a lighter swim and drills set for which I was very grateful. I still ended the session drained, but hopefully with enough in the tank for today's big ride. We were due to tackle the demanding Bedar climb, 10km long! Cycling about an hour to the base of the climb, we were to make our own way up at whatever pace we felt comfortable. I picked a nice low gear early on and started spinning my legs. The foothills went on for a good while, gradually gaining height, and then the switchbacks came. It looked like an Alpine Tour de France stage, amazing flat roads, switchbacks, and climbing on and on and on... The faster cycling group had taken a more circuitous route to the mountain and started behind us. They soon caught up though, I was seriously impressed at the pace Justin, Brendan, and the other speedsters came past us at. To make sure I was under no illusions as to my climbing abilities there was a cycle team out on the hill too - doing repeats of the top 3-4km! They flew down at an astonishing pace, before climbing past me like I was going backwards (which on some of the tight steep turns I thought I was). The TriLife’s trainee coach, Ashleigh, did a great job moving up and down the group making sure we were all OK, we were getting quite spread out so she must have worked really hard! I reached the top feeling a great sense of achievement - an amazingly long and hot climb, by far the biggest I've ever tackled. The downhill on the other side didn't deliver as there was another long climb half way (not as long as the main one, but my poor legs were ruined!). Returning to base I was totally drained now, there was a short brick run straight off the bike. In the morning we'd left some trainers in the back of the car, and Duncan and Liz were going to look after our bikes for us. I decided to try the Clif Double Expresso [sic] and Caffeine gel that I'd been keeping in reserve. It tasted lovely, very sweet and quite thick in texture unlike the runny sugar-fluid of some others. Downed the gel in one, and I was off. Tried to take a steady pace around the off road route, oddly the fatigue from the bike left me quickly and I maintained a good pace round the 6km or so. The gel seemed to be doing its thing. I finished strongly (I must have done, there were comments that I looked like I could have just kept on running for miles!). Today brought a welcome day off from swimming, instead a slight lie in, big breakfast, and off for the longest ride of the week. We cycled down the coast as one group before split into two (after a pause to take in the stunning view). I was really feeling the efforts of the week and was pleased I'd been assigned to go with the shorter ride group. We cycled back down to the coast to find somewhere nice for ice cream (high-fat, maybe not so low-carb, but with this level of exercise output it's not the end of the world). We rode around three hours, and the rest came in after about five. There was an optional run session in the afternoon which I chose to complete. Minimum of 30 minutes, maximum of 60. The session was 1km repeats with 1 minute rest. The aim was to run at the pace of your next race. My next race is the Rotterdam Marathon where I was looking at a target of three hours and thirty minutes. Therefore my repeats needed to be at 4:58/km. I started slightly too fast, and then found my pace. The repeats got harder and harder. My pace wasn't too bad, I finished strongly too, but it was blindingly clear that there's no way I could run that hard for 42.2 consecutive kilometres! I resolved to set a new target for Rotterdam when I got home, I just don't think I'm ready to knock out a 3:30! Penultimate day, and final swim session. The mission this morning was simple, a 400m time trial. Flat out. Get your race head on. We warmed up and then ready ourselves in our lanes. We'd split into heats, 6 swimming at once, 2 side by side in each lane. I was paired with my housemate, Claire During the week I'd shown that I could keep up with her to start with, but didn't have the stamina or strength to stay with her over a full session, and I'd fade quickly. I didn't expect to beat her, and I had to be careful not to overstretch myself. We set off, and I was side by side with Claire for the first 4 lengths. In retrospect this was not a smart move. During the 5th length I started to fill with lactic acid, my lungs and limbs burning with the effort. I'd gone off far too hard and was paying the price for it. During the second quarter I slowed significantly, before recovering into the second half. I'm not sure what time Claire got, but she was well ahead of me by the end! I clocked 7:09, which on balance is a good time. I haven't swum for months, and now I've just ticked over 10km in a week! My previous best was around 6:30, so there's a way to go yet, but it's a good start, and a great benchmark to work from. We had a break before "Magic Glutes" (a warmup/strength session with Mike focussing on the biggest muscles in the body, our gluteus maximus), and then a longer run. We had been assigned one, two, or three laps of a slightly longer off-road course, number of laps depending on what we're training for. I had three laps to do. The first was with strides for 30s every 5 minutes, and then the next two were "yo-yo". This meant 4 minutes very very easy, then 4 minutes at over target race pace - repeat until you run out of road! I put a lot of effort into this and it felt good to finish the session strong. Time to hit a few glasses of red wine in the bar, feed well, and another 9 hours' sleep! A last bike ride was scheduled for today. After a crisis of confidence at the decision point, I decided to go with the larger group on the reverse of the Bedar climb we’d conquered on Thursday. 20km or so of gradual climbing, a steep up, brief respite, and then even more up right to the top. I’m so glad I did - it was certainly the right decision. As Andrea said, “I’d hate to get on the plane thinking ‘if only I’d have just put that extra effort in’”. My legs were tired, but spinning well. We chewed through the foothills at a good pace. When we started on the main climb I fell off the back quite quickly. Thom got the other Claire, Andrea, and me working together - focusing on the back wheel of the person in front. “Let them do the work, let them pick the gear, let them pick the line - all you need to do is follow the wheel”. He was right, taking some of the decision-making pressure off and just following the wheel in front really helped. We took turns pulling the rest up as we felt strong, and being pulled up as we felt tired. It was a long climb. I learned a lot. The very last kilometre was particularly hard - I really didn’t have a lot left in my legs. With 200m to go Thom (or was it Mike who was with us by now? It’s all a bit of a blur) got us to sprint for the summit. I was out of the saddle, thighs burning with every ounce of effort I had left. Andrea made 25m on me, and I finally reached the top bright red, dripping in sweat, and totally spent. Bloody brilliant! A quick Clif bar, and we were on the descent. The 10km climb of Thursday went by much faster in the other direction. I’m not used to descending like this, so I took the corners cautiously. Regrouping at the bottom to head off in search of ice-cream and home it was clear I’d used a lot up on the climb. We were clipping along at a fair pace and it was becoming progressively harder to stop gaps opening up in front of me - and as soon as there’s a gap, there’s wind, and you’ll fall further back. Approaching one rise before we got to the coast we were getting faster and faster, when the hill came I almost stopped - come on legs, you can do it! The thought of ice-cream (screw low-carb when you’re putting out this much effort, I want an ice-cream) pulled me up, and we soon rolled down to the coast and found a cafe. The other group passed us when we were eating, so we hailed them and all rolled back to Desert Springs as one (all be it a little fragmented as those with any energy left enjoyed themselves riding off the front and having fun). It was all I could do to sit in the group and get pulled along! Mrs had plenty in the tank and played in the front group for a while. I hardly ever drink lager these days - believe me, this pint was divine! The very last session of the camp was a Yoga/stretch-down session. My poor battered muscles just about got me through, and we were done! Nothing to do now but clean up, relax in the sun, pack up our stuff, and hit the bar for the celebration dinner. Mrs and I were so shattered we couldn't party for long (understatement) and ended up turning in really early. Party-poopers! No training today, just up early and back to the airport in the bus. Sometimes I find a little internal sigh of relief when heading home. Maybe I miss London, or something about the trip hasn’t really lived up to my hopes and expectations. This time was different, I really could have stayed another week, though with a rest day before diving into the volume again! The coaches were all great, patient, attentive, instructive, and each in their own way appropriately firm when the situation required it. The other athletes were good fun - friendly, laid back, and with a range of experiences and stories. There wasn’t anyone I disliked or wouldn’t happily spend another week training with - remarkable! My objective for the week was to rediscover my thirst and enjoyment for swimming and cycling - that was certainly achieved. Mrs and I have already decided, circumstances permitting, that we’ll be back next year. The cycling was wonderful, I’ve never flown down descents like that, or creaked (me, not my bike) up such long climbs. I’ve never ridden in such close formation, or followed a wheel up a hill as it’s all I can focus on. I need to love the hills - my A-races this year (Ironman 70.3 UK Wimbleball, and Ironman Wales) are both very hilly. I’m excited about getting out on my bike and chewing up some Kent and Surrey hills. The swim sets were hard, I’ve never swum that far in the pool, I’ve never followed such a structured set, and I’ve certainly never swum over 10km in a week. And you know what? I loved it. I am really genuinely looking forward to getting in the pool at home. Thing is, I don’t know what to do when I get into it. Maybe I should give The TriLife a call and see about getting some coaching? Bye bye Murcia airport, see you next year? Excellent week, truly excellent. Thank you so much to the coaches Duncan, Liz, Mike, Thom, and Ashleigh. Bring on next year! Training has taken a setback over the last fortnight as a combination of Real Life and an annoying cold (first time ill since going #LCHF 16 months ago). It’s better to be well than forcing yourself to run weak or ill, so I dropped the volume and recovered. Good news - I’m now recovered! And not a second too soon - because I’m currently sat in the foyer of the Sofitel in Gatwick Airport North. Tomorrow morning at some ungodly hour Mrs and me are checking in for a flight to Murcia, Spain, to spend a week swimming, cycling, and running with the The TriLife (@TheTriLife on Twitter) crew on spring triathlon camp. 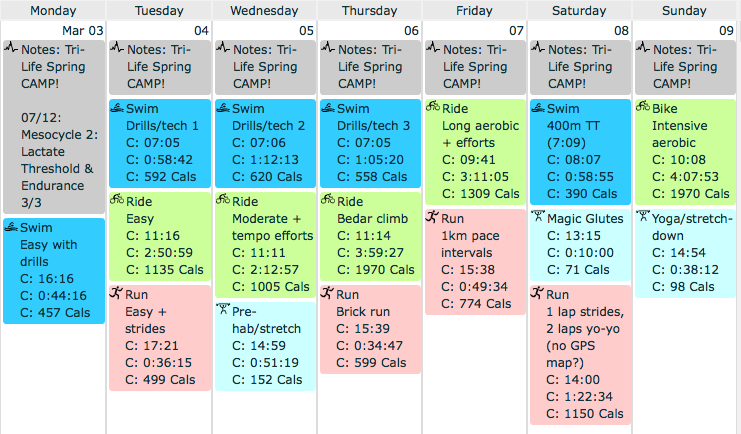 But then, that’s the point of Spring tri-camps; to get you back into your training and remind you how much fun it can be. There seems to be some free time (which is good, this is holiday after all) and there are options to choose depending on how you feel and what your objectives are. The tri-life guys we first met at the Ironman UK 70.3 Wimbleball training camp in 2012. Mrs has them as a coach, and we’ve bumped into each other at various races and events over the last year or two. The camp seems to be small and relatively relaxed. Mrs went last year and really enjoyed it, I’m really happy that we can share it this year. Looking forward to remembering the joy of cycling, plus a week off work in the Spanish sun - perfect! Y viva Espagñe!